Goldfish Street (金魚街) or Goldfish Market is located in Mong Kok, Kowloon, neighboring with other famous street markets in Hong Kong. It is a section of Tung Choi Street between Nullah Road and Mok Kok Road, passing through Bute Street. Goldfish Street is about 300 meters long with around 40 specialty stores selling all kinds of ornamental fish and more. It is crowded with goldfish and pet lovers, window shoppers and tourists. Some people believe that having a tank of goldfish at home can bring good luck to them. From the 1950s onwards, there were many hawkers selling goldfish and red worms near the Yau Ma Tei train station (close to today’s Mong Kok East Station). Then, they relocated to Boundary Street and Flower Market Road. In the mid-1970s, raising freshwater aquarium fish at home became a popular hobby. Goldfish hawkers then decided to move to fixed shops to continue their business. That’s how the Goldfish Street was formed. The Goldfish Street is like a free aquarium in the city centre. The way of displaying fish is very special and eye-catching here. A fish is put in an oxygen-filled transparent plastic bag and the price is marked on the bag. Bags of fishes are hung on iron racks in front of shops like bubbles. 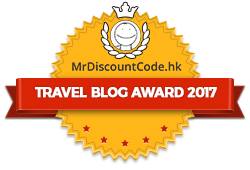 It is one of the best places to go window shopping in Hong Kong. You can find fishes in all shape and size here, from bubble eye goldfish to colourful tropical species. Also, daily necessities for fishkeeping like fish tank and fish food are on sale here. In addition to aquarium shops, a number of pet shops have opened in recent years. There are uncommon pets such as amphibian and reptiles, as well as traditional ones, like puppies and cats. There are also some street food vendors and tea restaurants. However, similar to the Sneakers Street, the Goldfish Street is expected to undergo redevelopment in future which may put the market in jeopardy. Most of the shops open daily at around 10:30am and close at around 8pm. Some of them open until 10pm. Shops usually close in the first few days of Lunar New Year. MTR Mong Kok East Station, Exit C. Walk to Sai Yee Street via the footbridge and walk downstairs to reach Bute Street. 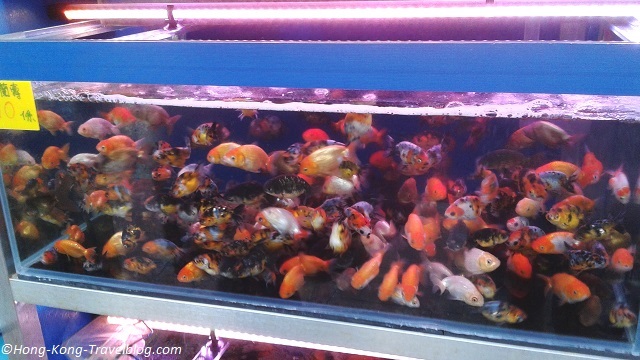 What do you like most about Goldfish Market Hong Kong? Please feel free to leave us comments or contact us if you have any questions. Thank you for reading this post. Please like us on Facebook and share our post!